Thoughts and prayers are not the same thing. We need to stop acting as if they are. Thoughts and prayers do not go hand-in-hand. We need to stop acting as if they do. Every time you hear someone say, "Thoughts and prayers are not enough", you are being manipulated and you need to understand why. Unless accompanied by action, thoughts accomplish nothing. Your thoughts may be a step along the way toward an action, but on their own, they are ineffective and in many ways without consequence. Every person chooses not to act on their mind's thoughts hundreds of times a day. A person who always says or does whatever comes to mind is considered posses little to no self-control. The idea of "sending thoughts someone's way" originated out of a desire to not have to tell someone you were "praying for them." It is a tool used by those who desire to empathize or want to give words of comfort but are unwilling to do so in religious terms. "Wishing positive energy for you." None of these are wrong or harmful, but in real life, none of them really accomplish anything other than perhaps cheering up a friend or encouraging a downtrodden soul. This is why James said, "If a brother or sister is poorly clothed and lacking in daily food, and one of you says to them, 'Go in peace, be warmed and filled,' without giving them the things needed for the body, what good is that?" Words, even kind and caring words, are no good without action. When encouragement is needed, expressed thoughts may be the perfect solution. When change is necessary, thoughts are not enough. But thoughts and prayers are not the same thing. The reason we pray is precisely because we know we are incapable of accomplishing what needs to be done yet we trust that God is more than capable and has already promised to always accomplish what needs to be done. We pray for those who have been hurt because we know God can bring comfort and sustain them through their pain. We pray for those who have done the hurting because we know God can forgive them and change their hearts. We pray for those must find solutions because we know God can grant them the wisdom and discernment necessary to lead us well. We pray for those with whom we disagree because we know God can empower us to listen and find unity in our action. Thoughts, on their own, will never accomplish anything. Prayer is all that is needed to accomplish everything. 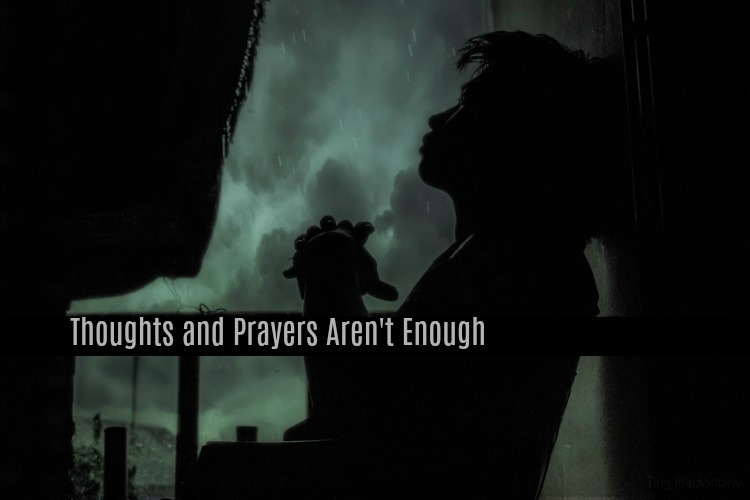 In recent days, we have all heard it said, "thoughts and prayers are not enough." More often than not, this is in regards to gun violence. While this clever and memorable sound-bite sounds convincing, it is actually misleading, harmful and deeply pagan. Although one might expect this to be the mantra of an activist atheist, these words should never pass the lips of a professing Christian. Often in politics, a person can be discredited not by anything they have said or done but because they are connected with someone else who has acted inappropriately. This is why many campaigns often try to link an opponent with a different nefarious character. Even though the politician may not deserve scorn or anger, their attachment (real or invented) to someone else can be an anchor that drowns their campaign. This is precisely what has been done to prayer through the "thoughts and prayers" campaign. We who follow Christ often send our thoughts to others (albeit always through words). We encourage one another, we build one another up, we let them know they are important to us. However, thoughts are very different than prayers. 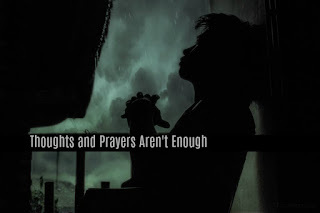 By allowing the social media universe to link "thoughts and prayers" to one another, the power of prayer has been lost to the inefficiency of thoughts. Thoughts and prayers do not belong together. They are not the same. It is a noble sentiment to express to someone that you are thinking of them. Your friends and family members are encouraged to know that they are on your mind. Yet, it is a far greater gift to bring those you love (and even those who don't love you) before the throne of God. We can all agree that thoughts are not enough. How can someone who believes in God say prayer is not enough? The time has arrived for us to abandon "thoughts and prayers", not because they aren't enough but because prayer truly is more than enough! Hi David. Saw your note on FB. I would still like to read your blog posts. Is there a way to subscribe? Heidi, I will try to set up a subscription button. Check back later and see if I am successful!